I honestly dread going to Costco alone. It is so crowded and I have embarrassingly poor cart driving skills. I love going to Costco with Jeff, he drives the cart and I wonder around, look at all the cool things and simply put them in the cart… no chances of crashing or breaking toes. Tub of Feta: for $11.79. That’s 900g! What a steal. I didn’t know this existed until I read this post. Thanks hungry runner girl! PS As soon as I get around to creating a blog roll, this one will be on the top of my list. 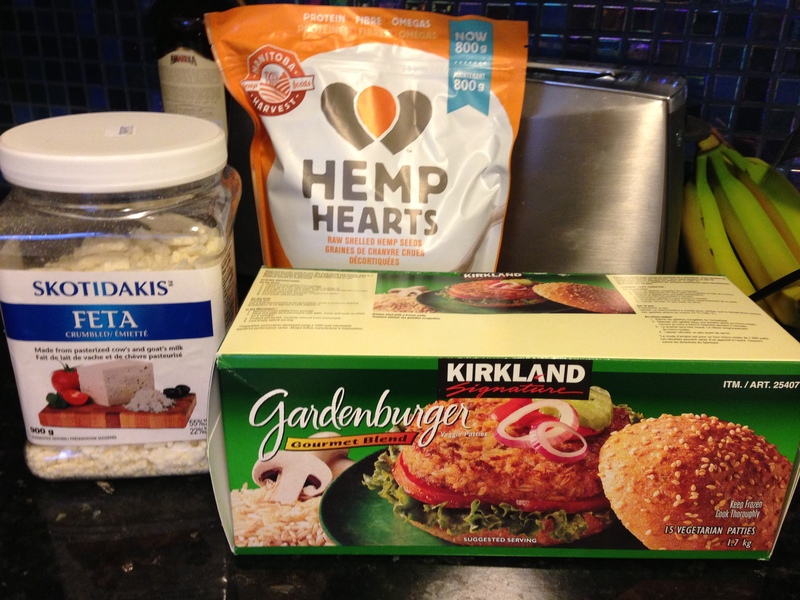 Kirkland Garden Burgers: They’re back!!! These burgers are amazing (they are infused with cheese) and they are only available during the summer BBQ season. I was surprised to see them so early but will definitely be sure to stock up for Winter 2014. Yes, they are that good. While waiting for Emma to text me back, of course I did a quick google search on my iPhone and was quite surprised to read the benefits. You can read all about it here: or google heart hemp benefits and click on the first one. I may need to do some more research on this.